Huge, clean rooms for a great price. Will be making this my go to when visiting the area. 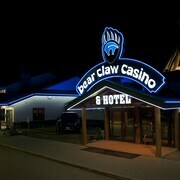 Where can I find hotels in Kenosee Lake that are near tourist attractions? 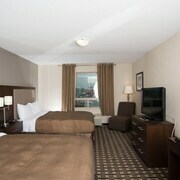 Although there are no Expedia hotels within Kenosee Lake, there are about 2 within a 0.1-kilometre (0.06-mile) radius. The closest of our hotels is the Ramada Carlyle, Saskatchewan, which is 25 kilometres (14 miles) from downtown Kenosee Lake. Another option is the Carlyle Western Star Inn & Suites, which is located in Saskatchewan, which is 20 kilometres (14 miles) from Kenosee Lake. 90 kilometres (57 miles) from Kenosee Lake is Moosomin, where travelers can enjoy the Estevan Art Gallery & Museum. Estevan is blessed with some comfortable places to spend the night. Or, visitors can stay at Moosomin, 55 kilometres (35 miles) to the northeast of Kenosee Lake. While in Moosomin, why not visit the Moosomin Regional Museum. The Moosomin Canalta and Moosomin Country Squire Inn are comfortable places to stay. Before you say goodbye to Southeastern Saskatchewan, catch a game at Carnduff Centennial Arena if you can make the time. Book a place to stay nearby for example the Western Star All Suites Carnduff. Regina International Airport is situated 180 kilometres (113 miles) from Kenosee Lake. 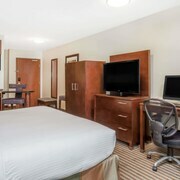 Travelers who wish to stay close by, can easily secure a room at the The Hotel Saskatchewan, Autograph Collection or Best Western Seven Oaks Inn. Are there hotels in other cities near Kenosee Lake? Explore Kenosee Lake with Expedia.ca’s Travel Guides to find the best flights, cars, holiday packages and more!